High-pressure steam is essential during the manufacture of Styrene from its constituent hydrocarbons. Unwanted condensation has to be discharged to the outside air through specially-designed steam traps. 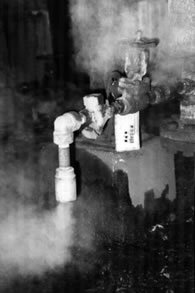 This high-temperature, high-pressure steam discharge at high velocities presents a number of hazards to employees working near the traps. 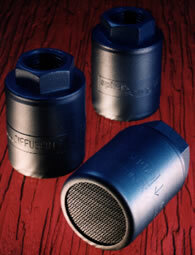 A-weighted noise levels alone can reach 100 dB. A major petrochemical company reduced noise levels significantly by fitting diffuser-type silencers to each trap discharge. These silencers operated on the principle that by slowing the jet discharge velocity, the noise output would be reduced. This reduction was achieved by passing the discharge flow into a short pipe of enlarged diameter through a flow-resistive material, typically stainless steel wire wool. The back pressure spread the flow to the larger diameter of the pipe without generating the associated noise-producing turbulence. An added advantage was that by diffusing the discharge it resulted in reduced ground erosion. The noise level decreased by 14 dB over a typical discharge cycle, with greater reductions in the mid-to high-frequency bands. Photographs courtesy of BP Chemicals Limited. Diffusers manufactured and supplied by Spirax-Sarco Limited.